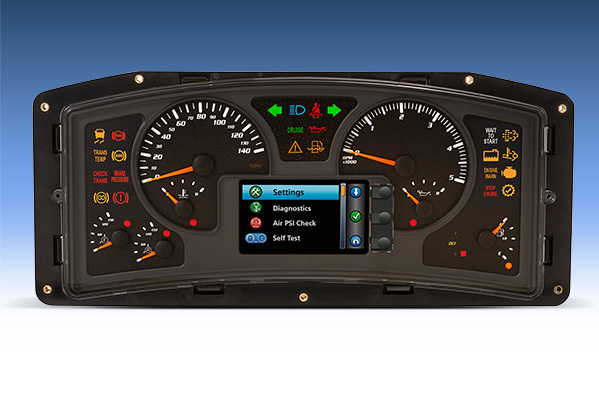 GRAND JUNCTION, CO – The UIP-CD (Universal Instrument Panel-Color Display) joins the UIP family of dashboard displays from AMETEK Vehicular Instrumentation Systems (VIS), the industry leader in custom dashboard instrument displays for heavy trucks and construction, military and other vehicles. The UIP-CD satisfies the instrument requirements for a broad range of vehicle platforms with easily customized gauges, telltales and displays. Based on AMETEK’s Next Generation Instrumentation (NGI®) architecture, the UIP-CD panel can be customized to specific vehicle requirements with minimal time and tooling (decal) costs. Its large, easy-to-read color graphics provide real-time data information, diagnostics, fault codes, user set up features and maintenance requirements on a 4.3-inch WQVGA (wide quarter video graphic array) LCD full-color display. The panel features up to eight gauges and twenty LED telltales, with four of them dimmable for night-time driving, and up to seven stepper-motor-driven gauges. One of the eight gauges is a bargraph gauge with four progressive bars that can satisfy requirements for a DEF (diesel exhaust fluid) gauge on Tier IV diesel engines. Its lowest bar can change from green to amber to red at customer-specified values to alert the operator of critically low conditions. The panel’s speedometer gauge automatically backlights either the major or minor scale, depending on whether English or metric is selected in the menu. The UIP-CD features an internal alarm with multiple sounds that can be configured for various alarm conditions. Five of the panel’s gauges have warning LEDS to alert the operator to existing conditions. The UIP-CD is sealed to IP53 specifications for in-cab applications. The instrument cluster features an anti-fog coating to meet J1810 fogging requirements and meets all SAE J1113 requirements for vehicular instrumentation. Headquartered in Grand Junction, CO, Vehicular Instrumentation Systems (VIS) is a unit of AMETEK Instrumentation and Specialty Controls, a division of AMETEK, Inc., a leading global manufacturer of electronic instruments and electromechanical devices with annual sales of approximately $4.3 billion. More information is available at www.ametekvis.com.